800Razors recently sent me its revised Men’s 3-Blade Razor that comes with 5 cartridges. Just by picking up the handle of the razor, you can tell that it’s a high-quality razor and that it’s made of metal. And since I’m all about saving money, I really like that the cost for the razor handle and the 5 cartridges is only $9.99. Plus, it’s shipped free! Of course, it’s really nice to have a good razor that doesn’t leave you with nicks, cuts, or razor burn. 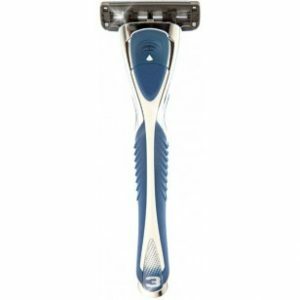 The Men’s 3-Blade Razor has three blades that are made from the finest steel and are Titanium coated to resist rust and make them last longer. Plus, they’ve recently made the blades thinner to cut down on drag. The Men’s 3-Blade Razor also has a soft, rubber Soap Bar and Virtual Guard that improves skin flow, cartridge balance, and ensures safety. And a lubricating strip with Aloe and Vitamin E helps reduce skin irritation. 800Razors wants people to have the best shave at the best price, and they back up their promise with their 100% money back Burn-Free Guarantee. The exclusive razor blade cartridge system is manufactured in the U.S. by a partner company that has been in the razor blade business for more than 100 years. Thanks to 800Razors, one Saving Cent by Cent reader will win the Men’s 3-Blade Razor that comes with 5 cartridges. To enter the giveaway, use the Rafflecopter form below. The giveaway will end August 29, 2013 at midnight MST. It is only open to U.S. residents. The winner of the giveaway will be notified by e-mail and has 72 hours to respond or a new winner will be chosen. 800Razors provided me with its Men’s 3-Blade Razor and cartridges to give away to the winner. All opinions are my own. We would love to win to check it out! I like that the blades last a long time. I like that you can save up to 50% on razors and they are burn free guaranteed. I like that the strip after the blades is coated with Aloe and E, to protect and soothe skin! My husband would like the burn-free guarantee and I like the free shipping and free handle with first order!